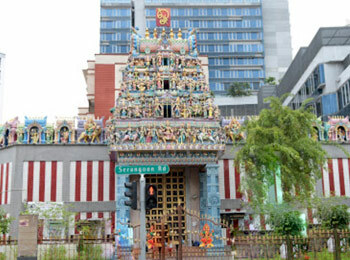 Sri Veeramakaliamman Temple is a Hindu sanctuary situated amidst Little India in the southern piece of Singapore. The Sri Veeramakaliamman Temple is devoted to the Hindu goddess Kali, furious epitome of Shakti and the god Shiva's better half, Parvati. The building is developed in the style of South Indian Tamil sanctuaries regular in Tamil Nadu instead of the style of Northeastern Indian Kali sanctuaries in Bengal, where Her love is to a great degree across the board yet the style of sanctuary development contrasts considerably. Kali has dependably been prevalent in Bengal, the origin of the workers who manufactured this sanctuary in 1881. Pictures of Kali inside the sanctuary demonstrate her wearing a wreath of skulls and tearing out the internal parts of her casualties, and Kali imparting more serene family moments to her children Ganesha and Murugan. Changi Airport is one of Asia’s best-connected airports and is an important hub for international aviation. Being an important gateway to Southeast Asia, mostly all major international airlines fly into Singapore. There is regular air traffic from Singapore to several destinations in Europe, Asia, the Middle East, Australia and North America. Regularly voted the world’s best airport, its facilities include a gym, several gardens, an outdoor pool, free internet, cafes and plenty of shops. The temple is open from 6AM to 9PM.